The response to a drug is dependent on the free concentration of the drug in the vicinity of the receptor site. It may be influenced by a variety of factors. These factors include transport mechanisms, metabolic enzymes, and binding sites within the tissue that would lower the concentration of drug in the vicinity of the receptors. For example, acetylcholine would be hydrolyzed by acetycholinesterase and norepinephrine would be subject to transport mechanisms, which would decrease the concentration of these compounds that can interact with the receptor. In the iris, lipid soluble drugs can bind extensively to melanin pigment, which would reduce the amount of drug available to interact with receptors. For example, the effectiveness of atropine in blocking muscarinic receptors of the sphincter muscle of the iris is lower than predicted because it binds to the melanin pigment. The free concentration of the blocker is lowered. As a result the slope of the pA2 plots corresponds to a composed line in this tissue (Figure 10). Figure. 10. 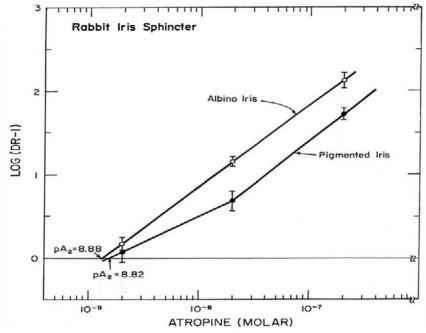 Schild plot for the antimuscarinic effects of atropine on the sphincter muscle of albino and pigmented rabbit iris. The agonist used for this study was carbachol. The Schild plot for atropine in pigmented iris is not linear because at high concentrations the binding of atropine to the melanin pigment decreases the concentration available for interacting with the muscarinic receptor. Figure from Salazar et al. reproduced with permission from the American Society for Pharmacology and Experimental Therapeutics. The state of the tissue as a result of prior drug treatments or surgical manipulations may alter the responses to a drug. For example, if a sympathetically innervated tissue is pretreated with cocaine, the response of this tissue to norepinephrine will be enhanced. Cocaine, by inhibiting the high affinity transport of norepinephrine into the sympathetic nerve endings, would produce an increase in the concentration of norepinephrine available to activate noradrenergic receptors, causing the concentration-response curve to shift to the left. It is of interest that inhibition of the activity of the enzymes, monoamine oxidase and catechol-o-methyl transferase produces a much smaller enhancement of norepinephrine effects, because these enzymes are more concerned with long term changes in norepinephrine concentration at the synapse and less with acute changes. Similarly, other conditions that affect the noradrenergic synapse, such as postganglionic sympathetic denervation, chronic reserpine, and ganglionic blockade also can produce a shift to the left in the response to norepinephrine. Denervation, like cocaine, results in a loss of uptake sites, enhancing the synaptic concentration of norepinephrine. Reserpine, ganglionic blockade, and denervation attenuate the norepinephrine released from the sympathetic nerve endings, producing receptor supersensitivity. 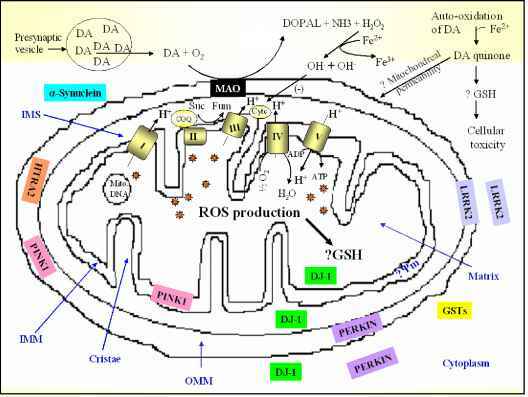 In these situations, there is an increase in the number of receptors along with other membrane changes and consequently the response to norepinephrine is enhanced. A competitive antagonist can block the receptors for both endogenous neurotransmitter and exogenously administered agonist. However, it has been found at some synapses that the antagonist is less effective in inhibiting the response to the stimulated release of the endogenous neurotransmitter than that to exogenously administered drugs that activate the receptor. For example, while the competitive ai receptor antagonist, phentolamine, will block the effects of both exogenously administered and endogenously released norepinephrine, it produces a greater inhibition of the effects of exogenously administered norepinephrine. There are several possible explanations for this paradoxical effect of phentolamine. Substances may be released from neurons (in addition to norepinephrine) that produce a response that is similar to that of norepinephrine but mediated by a different receptor, which is not blocked by phentolamine. Alternatively, the endogenously released norepinephrine may act at different sites than exogenous norepinephrine, and phentolamine may not reach the required equilibrium concentration at the neuroeffector junction where high concentrations of norepinephrine are released. It is also possible that phentolamine by blocking autoreceptors on presynaptic nerve terminals markedly enhances norepinephrine release at the neuroeffector junction, which would tend to overcome the blockade by phentolamine at the postjunctional site. Since the response to exogenous norepinephrine does not require nerve activity, it would be less affected, if at all, by autoreceptor blockade. 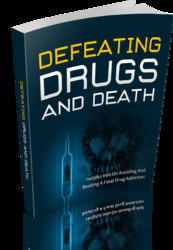 Thus, the effectiveness of a given dose of antagonist may depend on whether the response to an endogenous or exogenous substance is being antagonized. When the effect of a drug is determined in vivo, the response may be modified by adaptive reflex mechanisms that oppose the action of the drug. For example, the response to vasoconstrictor drugs would be rapidly reduced by vasodilation and cardiac slowing, while the response to vasodilators would be offset by vasoconstriction and cardiac stimulation. Thus, while a drug may produce a response in one direction, compensatory mechanisms may be triggered that stimulate the opposite response.